Contents and Media: Soft-cover book, 80 pages. Advantages: Excellent detail photo coverage of the only existing Irving. This is the first book in the Modeler’s Eye series from Model Graphix, which provides a detail reference linked to a specific model kit. Although the book is specifically designed to assist those building the 1/48 Tamiya Gekko kit, it would also useful for building similar kits produced by other manufacturers. The format of the book is very similar to the Aero Detail series of books, also published by Model Graphix. The book starts out with a one page history of the only existing Gekko, s/n 7334, a late model aircraft with radar nose and individual engine exhausts owned by the U.S. National Air & Space Museum. The main part of the book is comprised of color photo detail coverage of this fully restored aircraft, broken up into sections (cockpit, landing gear, wings, and so on). The captions next to the photos are in Japanese, but there is an English caption page at the end of each photo section. Many of the photo captions include comments about the corresponding parts of the Tamiya kit. 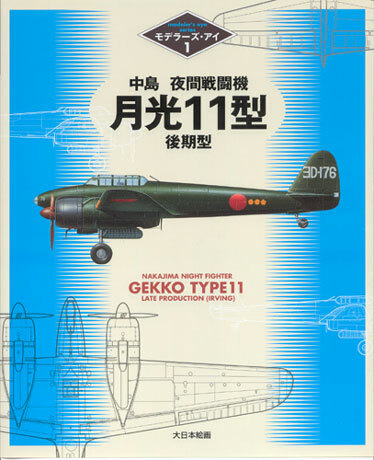 The photo sections are followed by a color and markings guide, which includes a number of color side profile drawings of various Gekkos, each with a short history of the particular aircraft and, in many cases, also a contemporary photo of the aircraft. The profiles include both humpback and straightback aircraft, although none of the humpbacks have photos. In case anyone is wondering, this book deals with the nightfighter versions only. There is no coverage of the original fighter or recon versions in the book, other than a passing mention in the history section. The book ends with a few photos of an expertly built up Tamiya kit, and 1/72 scale line drawing from Tamiya. There are currently two other books in the Modeler’s Eye series. Number 2 covers the F/A-18 Hornet with emphasis on the Hasegawa 1/48 scale kit, and Number 3, which has just been released, covers the Bf 109G-6. If you are looking for a good detail reference to go with the Tamiya kit, this is it. Highly Recommended!